I don't remember ever receiving mail in a bag like this before, so it was quite special when the postman dropped one off this morning, and it was from Latvia no less... You guessed it, it's a new shipment from our friends over at Balkan small press kuš! Shall we proceed to an unboxing, quasi-live-blogging style? 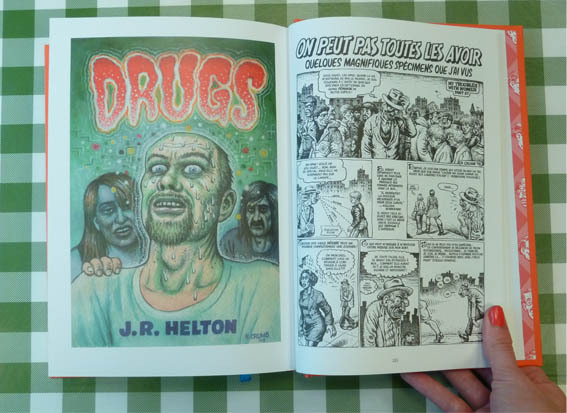 Two pages by Jean de Wet (South Africa), some panels remind me of the wonderful Ron Regé - I love it! Colors! This is Drifting Blur by Simon H (Austria). And that's not all, the box also came with free postcards, illustrated by Roope Eronen and D+Q artist Amanda Vähämäki - come get them before we run out! Thermae Romae de Mari Yamazaki est le nouveau "manga événement." Cette comédie déjà vendue à 5 000 000 d'exemplaires suit l'architecte romain Lucius Modestus alors qu'il découvre un passage à travers le temps qui le fait émerger dans différents bains japonais du vingtième siècle. La série a également été salué par la critique - ce n'est pas donné à tout le monde de gagner le prix Manga Taisho en même temps que le prix culturel Osamu Tezuka! À la fin de chaque chapitre, l'auteur fait part de ses recherches sur les bains de la Rome antique et raconte ses expériences de bains à elle, au japon, en voyage, ou à Chicago (où elle habite). On trouve dans le second volume un chapitre hilarant dans lequel Lucius découvre, frémissant, les glissades d'eau: "C'est terrifiant... et amusant à la fois!!!" Le troisième volume nous arrive sous peu! En attendant, vous pouvez visionner l'adaptation animée, ainsi que celle en prise de vue réelle. The 24th issue of the happy mag for kids is here! Inside the magazine, you'll find comics, illustrated stories, book reviews written by young readers, an article on where holidays come from, one on 'yuck stuff', another on 'travel stuff', and more! The Making Of is here! Boy was I surprised to find out that Flannery O’Connor originally set out to be a cartoonist. That’s right, the same Flannery O’Connor who would later be known for her literary works on the American south and Catholicism actually started her young career by creating cartoons in ink and linocuts. In terms of artistic ability, she’s far from the genius of woodcut and linocut artists Frans Masereel, Lynd Ward, and Giocomo Patri. Yet considering how O’Connor produced these works during her teenage years, there is some undeniable talent here. Left: "Isn't it fortunate that Genevieve has completely escaped that boy-crazy stage?" Right: "You don't mind if I get comfortable, do you?" Left: "Gosh, we're glad to be back." Right: "Do you think teachers are necessary?" Vol. 3, the latest issue of the mag, teaches us how to make the chilled ice tea beverage of the summer. Offering two methods, "Sun Brew" and "Cold Brew", they ensure you will never go thirsty or sweaty again. Further on in the magazine you'll find a foolproof guide to a Québec-style picnic. Including local cheeses, preserves, and meats, you will be envied by all of those around you on Parc Lafontaine who suffer with a lone hard baguette and goat cheese to feast on. As Vol. 3 is centered on the Great Outdoors, Pure Green Magazine provides us with a "planishere". Made to be cut out and directed towards the dark dark sky, a planishere helps to pinpoint all the various constellations. I'm hoping this tool will be able to help me finally find my illusive Hercules. Remember how you went canoeing that one time but it was awful because you didn't know how to properly row your paddles? You just sat there floating whichever way the water decided to take you. No more. From the Forward Stroke to the Draw (moves canoe sideways) to the Sweep or C Stroke (turns the canoe), you will learn to maneuver that canoe like a symphony. Or at least like a whistle. Finally, this recipe looks fantastic. They look like dandelions, they are called Monkey Pops, and there is coconut and banana involved. This is precisely what I am going to eat for dinner tonight. About six years ago, I received two comic books as a Christmas gift: Daniel Clowes’ GHOST WORLD and the Drawn & Quarterly's SHOWCASE #3. I never read comics as a kid, and was totally blown away by these titles. I quickly made my way to my neighbourhood comic book shop (the great Millenium) and picked up Jaime Hernandez’s MAGGIE THE MECHANIC out of the blue. And that was it... I was in love. In a matter of a few weeks, I had read pretty much the whole series from both brothers. Fast forward a few years and my interest in the Hernandez Bros got even more serious, as I completed my Master’s thesis on Jaime’s portion of the Love and Rockets series and wrote an encyclopedia entry for Gilbert's SLOTH. That's right, I’m that big of a fan. Why all the nostalgia? Well, pretty much to explain my utter and absolute excitement when my awesome co-workers surprised me yesterday with the coolest gift ever, all the way from the San Diego Comic Con. Ladies and gentlemen, feast your eyes on LOVE AND ROCKETS NEW STORIES #5, signed by ALL THREE BROTHERS!!! On right, from top to bottom: Jaime, Mario, and Gilbert. As if this wasn’t generous enough, they got me a really rad L&R t-shirt to boot. I seriously had a smile plastered on my face all day. I read the new issue this morning and it was incredible. Beto presents us with another dark tale from Palomar, and Jaime brings back the "too cool for school" Frogmouth Vivian for an exceptional tale about some mafioso cats. After all these years, the Hernandez Brothers continue to knock it out of the park with some of the best work in the industry. 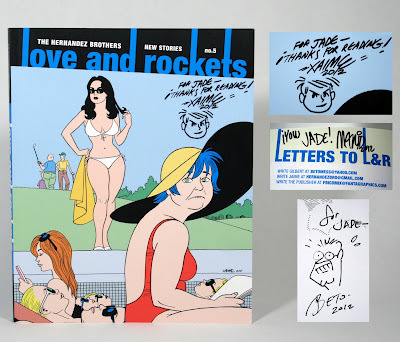 Although LOVE AND ROCKETS NEW STORIES #5 will only be released in September, fret not, I have been doing my very best to keep the store stocked with all things Love and Rockets, including Jaime’s recent GODS AND SCIENCE: RETURN OF THE TI-GIRLS and Gilbert's THE ADVENTURES OF VENUS. If you are new to the series, come and talk to me at the store and I'll gladly help you with some recommendations! This Friday July 27th we are delighted to host a reading with stand-up comedian Moshe Kasher, who Variety Mag has put on their list of '10 comics to watch 2012.' They say: "After years of sharing crazy stories onstage, Moshe Kasher agreed to try something different. The comic arranged the outrageous details of his upbringing into a published memoir, Kasher in the Rye." And we get to profit from this! 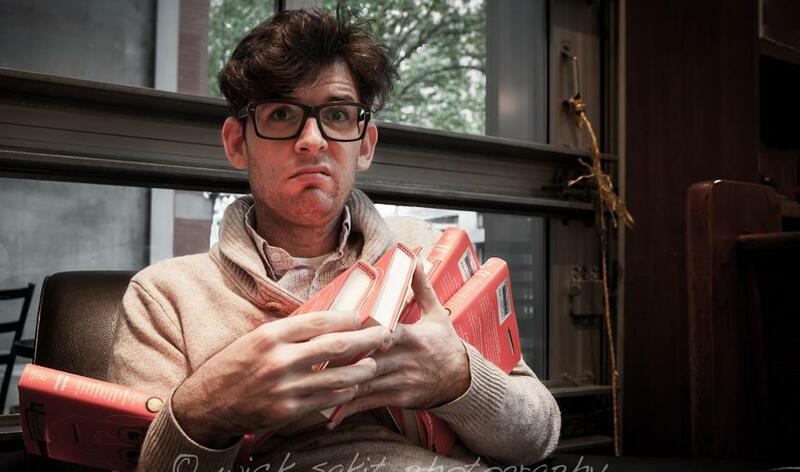 Leading up to a few events at the Just For Laughs Festival, Moshe Kasher will be reading from Kasher in the Rye at the Librairie D+Q this Friday, July 27th, at 7 pm! Publishers Weekly described Kasher in the Rye: The True Tale of a White Boy from Oakland Who Became a Drug Addict, Criminal, a Mental Patient, and Then Turned Sixteen as a "memoir of high-octane intensity," saying that "although Kasher in print is not as funny as his hilarious stand-up routines, he writes with an imaginative flair and a razor-edge ferocity." Now, I know we all like to really study up before a book launch, so check out this A.V. Club interview from earlier this year. I have a couple friends who are stand-up comics, and so some of what they talk about within the interview is familiar to me, but I honestly had never thought about whether the zeitgeist allows for sincerity in a time of so much irony, or how stand-up culture can be a fascinating reflection of contemporary society. But finally, the real reason you should come on Friday is because, let's face it, authors aren't always performers, but stand-up-comics-turned-authors certainly friggin' are, and this promises to be a rollickin' good time. Phew. The tail end of last week was jam packed with events at the Librairie. And these weren't just any hum-drum events. They were EXCITING, FESTIVE, and EYE-BROW-RAISING events, attended by the finest of D+Q's glitterati. Conundrum Press publisher Andy Brown starts off the night by introducing everyone to Claire Seringhaus, author of the gothic and absurd The Blaring House. Seringhaus delighted everyone with her talk as she presented excerpted images from her book. Her pen and graphite drawings are funny, charming, and completely off-kilter. Then the Québec legend himself, Michel Rabagliati, takes the stage! Presenting the latest volume of his PAUL series, The Song of Roland (original French title: Paul à Québec), Rabagliati gives a thoughtful and satisfying talk to the audience on his creative process. Visual evidence of Rabagliati's thoughtfulness during his talk. At the end of the evening, the two artists spend time to sign books for their devoted fans. Cheers to a great night! Chris Oliveros, forever to be known as The Chief, starts the evening off with a grand introduction to the work of Guy Delisle. It's when ones career is put into the tight framework of a 5mins intro of accomplishments and awards that you really remember how influential and noteworthy Delisle's work has been. Delisle takes the stage and gives a thorough talk on his series of travel-biography books. He disappointed many by saying that Jerusalem will likely be his last of the ilk, but mentioned a couple of new and different books he has coming out in the near future. Improvising his presentation, Deslisle used examples of panels from past books to answer questions and refer to points he was making. He discussed how translated editions of his books often interpret his books completely differently then how he would have expected, showing us a diverse collection of his translated book covers. After the talk, Delisle sits to sign books as his fans form a long yet giddy line. He drew a picture in each and every book for about an hour. So even the last person in line received a surprising treat. All in all, great event! Peggy Burns got on stage to bid farewell to our dear Jessica Campbell, the D+Q Design Manager. Jessica is moving to Chicago, so this event was a going away party as well as a launch for her zine My Sincerest Apologies. Jessica was on fire as she showed pages from her zine and added quick one-liner jokes. JOKES! This event was all jokes and it was hysterical in the best possible sense. Jessica has the crowd in the palm of her hands, as they giggled their night away. And after the event, the hip crowd migrates outside where they can cool off (from their hotness and from the humid indoor heat). Here is Jessica at the end of the night holding the gift given to her on stage by Peggy earlier in the evening on behalf on the D+Q staff. It's the original art of the new front and back cover of Lynda Barry's Freddie Stories that D+Q will be releasing November 2012! Good Luck Jessica! All the best in the US of A.